When I was a little girl, my father used to travel abroad often as a buyer of chemical materials. One evening before his departure I told him that I would miss him while he was away. Then he said to me, “Mari, look up at the sky if you feel lonely at night. I will be looking at the same moon.” I never imagined that I would co-author a moon-themed story back then. I had the honor to co-author the picture book, Lily and the Moon (ELF Learning), with a renowned picture book author, Patricia Daly Oe. Like many other projects, this collaborative work turned out to be a nonlinear process which involves a lot of discussion, both casual and focused, and numerous decisions to be made during the process. In this short article, I will share the journey I took with my amazing coworkers for this project. I first met Patricia in 2009 when I was at an ELT event where I presented my ELT textbook. She was also there to present her own picture books. We barely had time to talk but we felt that we shared some common thoughts and feelings on education and child development. In 2010, we had dinner at a noodle shop in Tokyo, and our conversation lead to a nostalgic talk about our care-free childhood memories and our fun-filled parenting experiences. We both felt that children these days are missing out on some of the valuable experiences that we had as children such as playing outside till it gets too dark to play, engaging in imaginative play using simple materials around the house and adventures in the woods. Then we thought of creating some picture books together along the themes of adventure and friendship. This meant that we would write the stories together and Patricia would be in charge of illustrations for them. In early spring 2011, we had a meeting at an Indian restaurant in Tokyo. Well, somehow, our meetings almost always involve dinner! I shared a very rough story idea with Patricia there – a story where different animals see different images on the moon and they see the same image in the end. I’d always wanted to write a story with the moon in it, but I never got to make it a coherent story. 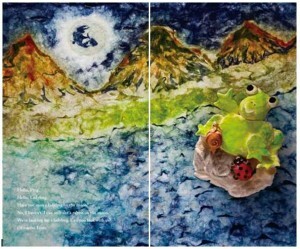 Patricia, with her several picture books under her belt, came up with this great idea of making it an adventurous story of several creatures traveling together to find a certain image on the moon, which became the core concept of the story. We picked a ladybug as the main character of the story because of its round shape just like the moon and its contrasting size against that of the moon. We discussed whether we would include some cultural landmarks such as Mt. Fuji and the Eiffel Tower, and present them with what the people in the area see on the moon so that children can learn geography and cultural differences from the story. We eventually disregarded this idea because we wanted to avoid making the story too obvious, ending up limiting children’s imagination. After the meeting, we did research on what images people around the world see on the moon which was quite a learning experience for us, and discussed the story further through e-mail. We had to go through some tough personal experiences such as the passing of Patricia’s mom and my dad, both of whom gave us the inspiration for the story, during the process. It took longer than we had expected to complete the first draft, but our passion for the story never faded away. Once we finished the first draft of the story in early 2012, it was time for us to find a publisher. 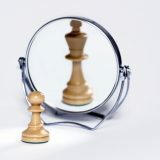 We knew that it would not be easy to find one given the general economic climate surrounding publishers. 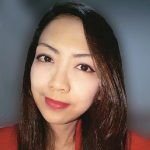 Very fortunately, though, I had a personal contact with Eric Kane, the owner of ELF Learning, one of the most reputable education companies based in Japan, and we brought the story to him with some sample artwork created by Patricia. Our proposal was accepted by ELF Learning, and the second leg of our journey started. Because Patricia, Eric and I live apart from one another, we had most of our discussions on-line, though Skype and e-mail. We wanted to make our picture book appealing for native speakers of English and accessible for ESL/EFL learners at the same time. To meet this end, we revised the text numerous times. While we were working on this aspect of the work, Patricia created the illustrations for the book using her own handmade Japanese washi-art and light clay figures, which added natural warmth to this story with its simple and repetitive language. Its innocent atmosphere and deep expressions were later captured in the photographs taken by Etsuo Kawamura, a professional photographer based in Tokyo. Patricia spent more than five months making the artwork and many hours in a photo studio with Mr. Kawamura to supervise the shooting sessions. Eric devoted his time and energy on the production of the introductory video and song based on the story, and coordinated the composition of the background music by David Freeman and the recording of the song by Deborah Grow. I, with some valuable input from Patricia and Eric, designed language learning activities to be included in the Lily and the Moon Education Pack. All of these were happening at the same time in late 2012 and early 2013, and perhaps you can imagine how many times we scratched our heads, twisted and turned, had sleepless nights and of course screamed for joy during this process. 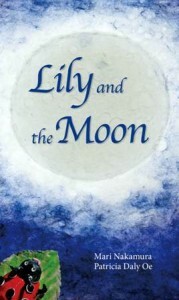 Lily and the Moon was published in June, 2013. Nothing delights me more than hearing from classroom teachers how they have enjoyed reading the book with their students, singing the Lily song as a whole class, and doing some fun activities based on the story. I have also been amazed at how many people have their own fond memories that involve the mystery and beauty of the moon. Looking back on this journey, I see it as an adventure full of discovery which was only made possible with my professional friends’ passion and talents. And this sense of adventure, discovery and gratitude for friendship is what Lily and the Moon is all about. 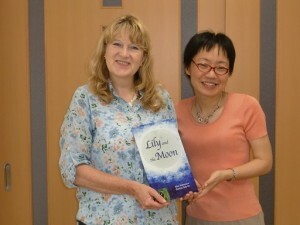 Lily and the Moon and Lily and the Moon Education Pack are available at englishbooks.jp. Special thanks to Patricia Daly Oe for offering input for this article. Note: This article by Mari Nakamura originally appeared as a guest post on Teaching Village and is licensed under a Creative Commons, Attribution-Non Commercial, No Derivatives 3.0 License. If you wish to share it you must re-publish it “as is”, and retain any credits, acknowledgements, and hyperlinks within it. 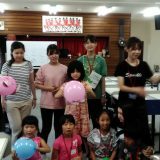 Mari Nakamura has been teaching children and teenagers for over 20 years at her own English school, English Square in Kanazawa in Japan, while providing teacher training sessions in major cities in Japan. 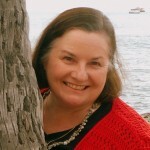 Her publications include Lily and the Moon (co-authored with Patricia Daly Oe, published by ELF Learning) and English Land (co-authored with Seino Akiko, published by Pearson). She has earned an MSc in TEYL, and is a lecturer at Language Teaching Professionals TESOL Certificate (Young Learners) Program. 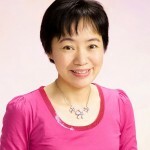 She is also a regular contributor to JALT TC-SIG TLC Newsletter. Thank you so much for giving me this opportunity to share my literary adventure with the amazing illustrator/writer Patricia Daly Oe and producer Eric Kane. It has truly been a once-in-a-life-time experience! It will be our great pleasure if many children, parents and teachers around the world enjoy the journey with Lily and her friends.